Perhaps the most interesting thing about Microsoft and Apple is just how similar they were in a number of ways. Gates and Steve Jobs, the CEOs who came to represent the two companies, were both born in 1955. Both later dropped out of college. 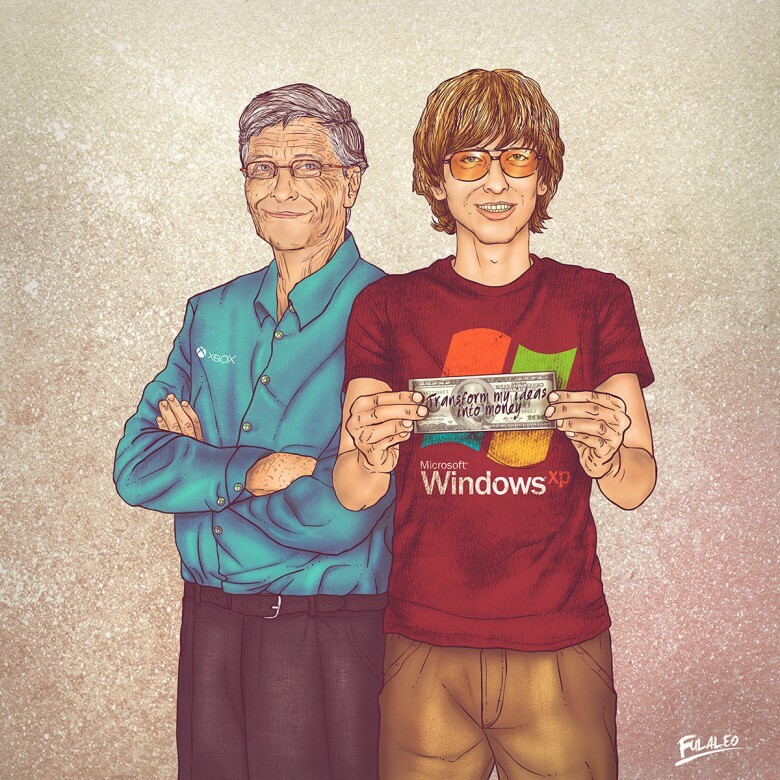 Gates and Allen created Microsoft when they saw a gap in the market following the launch of the Altair 8800 kit computer. In Silicon Valley, the launch of the Altair inspired the creation of the Homebrew Computer Club, where Jobs and Steve Wozniak first showed off the Apple-1 computer. It also sparked the creation of the Byte Shop, the computer dealership that first stocked Apple’s debut computer. Microsoft became a major developer for the Mac. After Jobs left Apple in 1985, Microsoft used its position as the maker of Word and Excel to strong-arm Cupertino. As a result, Apple CEO John Sculley signed a deal granting Microsoft “non-exclusive, worldwide, royalty-free, perpetual, nontransferable license to use [parts of the Mac technology] in present and future software programs” for its then-fledgling Windows. The use of Apple-inspired tech helped Microsoft’s Windows rise to prominence in the late 1980s and 1990s. (Although Gates still maintains that both companies simply borrowed from Xerox PARC.) Windows’ success coincided with Apple’s fall from grace as its margins increasingly got squeezed. Bad business decisions, like licensing “clone Macs,” threatened to sink Apple. For years, Apple battled Microsoft over the appearance of Windows, which looked suspiciously similar to Mac OS. Initially, Apple sued Microsoft for 189 counts of copyright infringement relating to Windows 2.0.3. Other lawsuits followed. The long-running Microsoft-Apple legal battles ultimately got resolved in August 1997, when Cupertino agreed to drop all lawsuits against its rival. Apple also agreed to make Internet Explorer its default browser (later replaced by Safari). Microsoft bought $150 million of non-voting Apple stock, and continued to support the Mac in terms of software. The cash injection came at a time when Apple was reportedly months away from bankruptcy. Not too long after, Microsoft hit its tech bubble peak and began to decline in the early 2000s. Meanwhile, Apple released the iMac G3, iTunes, iPod, iPhone and other products that fueled its rise to dominance.